Solar panel cleaning, why is it important? Solar panel cleaning is more important than you might think! It’s not just a matter of making your solar panels look cleaner, it is to improve the output of your solar panels, resulting in more money in your pocket. The build up of pollution, lichen, dust and animal droppings create a layer on solar panels that creates a shadow over the solar cells. As the cells rely on light(photons) and not heat, the shadow reduces the efficiency of the cells. It is critical that the correct process is carried out to clean solar panels, using only De ionized water as opposed to using chemicals or detergents. Once the clean is finished, the de ionized water dries spotlessly clear. Solar panel cleaning is not the only thing we do when we are up on your roof. We also carry out a visual inspection of your inverter and solar panels to ensure the system is in good working order and free from factory defects and poor workmanship. We have come across many jobs already that have had defective panels and inverters, and the owners have been able to make warranty claims thanks to our written reports that are always back up with photos. To see the results of some of our work, feel free to check out our facebook page here. The before and after photos need to be seen to be believed. We also boast a 5 star rating with amazing REAL reviews from our customers. To check them out click here. 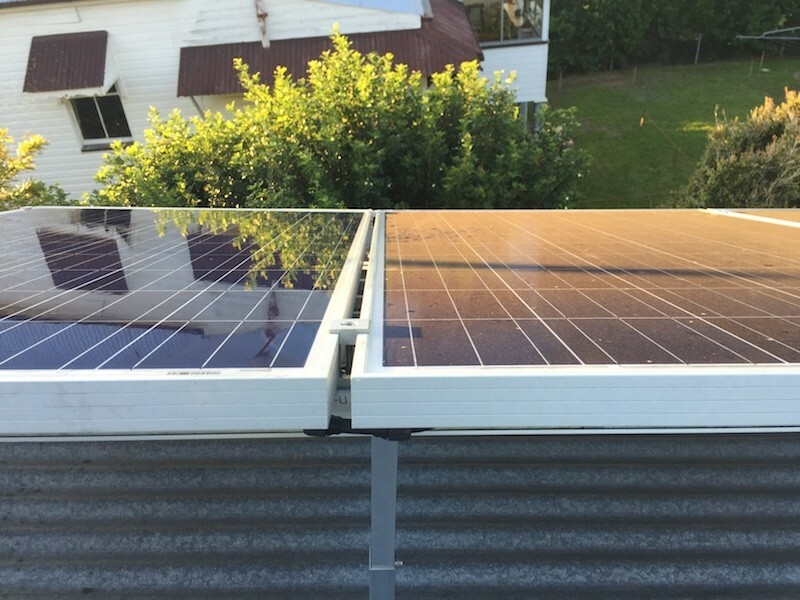 If you live in Ipswich or Brisbane (including surrounding areas) and wish to get a quote, click here, or call 0730887070. if you live on the Gold Coast, click here to get a quote from our friends at Spick n Span Solar. I Clean Solar – Regain your solar efficiency!